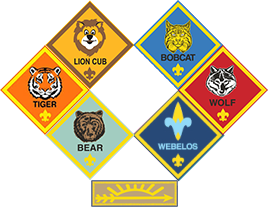 Scouts and their adult leaders/parents will live in 5- person BSA wall tents with cots and platforms, eat at the camp dining hall and experience a wonderful program. The program at camp includes opportunities for Scouts to earn Achievements, Pins, Belt Loops, and several just-for-fun activities. The importance of Cub Resident camp to a Cub Scout and their family is tremendous! Resident Camp will develop your son’s or dens’ self-reliance and resourcefulness by providing learning experiences in which campers acquire knowledge, skills, and attitudes essential to their well being. Visit the Official Camp Snyder Summer Program page for details.